The annual Wildfire Community Preparedness Day is coming up in May. It’s not too early to start spreading the word! Wildfire Community Preparedness Day is a national day of community action towards wildfire readiness and risk reduction. “Since the inception of National Wildfire Community Preparedness Day, NFPA and State Farm have partnered together to give communities an opportunity to apply for $500 to fund their wildfire risk reduction activities. The deadline has passed for 2019 but if you didn’t apply, we still encourage you to hold a Preparedness Day event this May! Need project ideas? Click the button below, courtesy of our friends from Fire Adapted Communities Learning Network. "We had a very busy May 6 fire fuel reduction project. Approx. 6 tons of dry trees, grasses, shrubs, etc were removed and mulched to be used along the borders to further reduce our fire risks. We are very grateful for the funding that allowed us to make our community a more fire resistant and safer place to live." In the evening (starting at 6:00 p.m.) on Friday, May 10 at the Pahala Plantation House, you can join HWMO and NMOK for a free and family-friendly educational “ReadySetGo!” Wildfire Preparedness Workshop. Participants will learn how to use proper landscaping techniques and home structure modifications to protect your family and property from wildfire and to work as a community towards the common goal of fire protection. HWMO will also share information on how to develop a clear, achievable family emergency plan, what actions to take during a wildfire, and proper evacuation procedures. Each attendee will also receive a free copy of the ReadySetGo! Hawaii Wildland Fire Action Guide, which can be used as a step-by-step tool for carrying out the recommended actions. 2019 is shaping up to be a busy wildfire year. With a weak El Niño starting to kick in, experts predict wildfire activity will increase due to worsening drought conditions and the enormous vegetative growth from a rainy past several of months. Wildfires are a growing health and safety concern in Kaʻū and throughout the Hawaiian Islands and have impacts to our communities, businesses, infrastructure, watersheds, and cultural and nearshore resources. 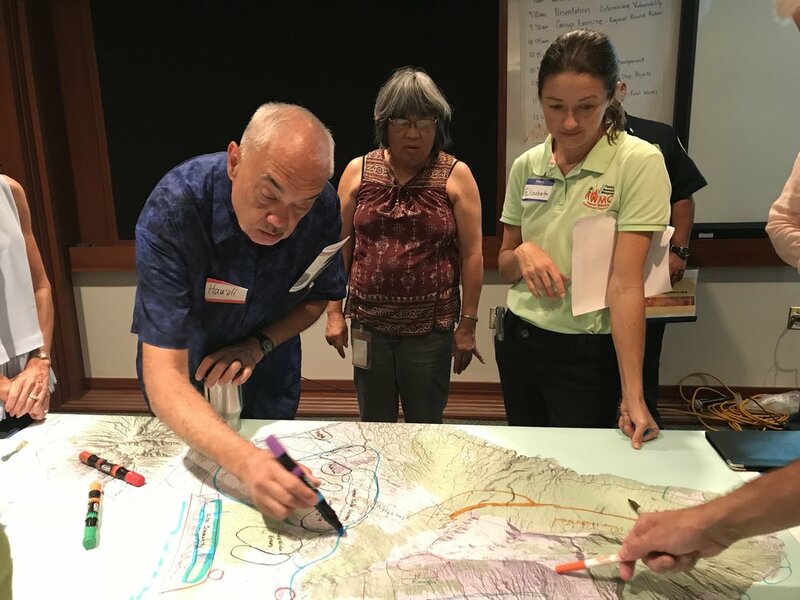 Recently, two large workshops were held on Hawaiʻi Island to identify key target areas for vegetation management activities to reduce wildfire risk. 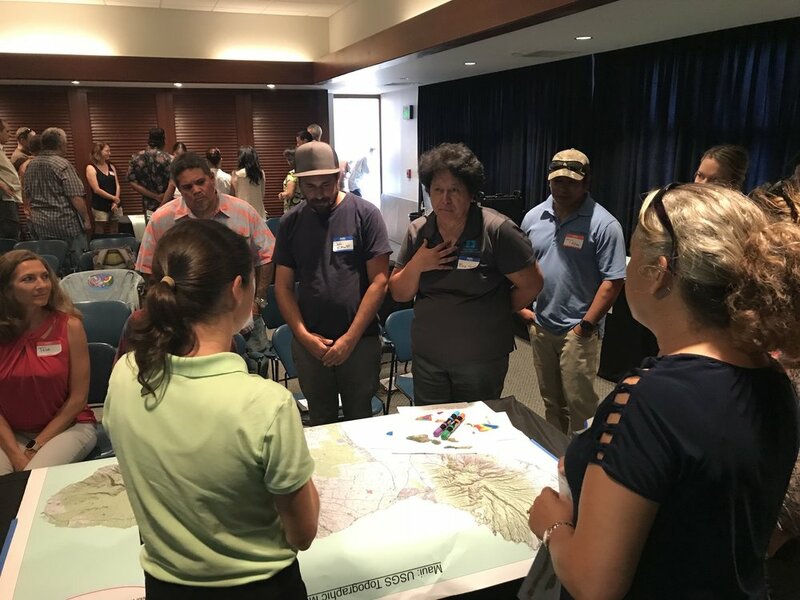 A significant portion of the participants, who represented various agencies, non-profits, businesses, and community groups highlighted Kaʻū as a top priority district for future wildfire management activities. On Saturday, May 4, people from across the U.S. will participate in Community Wildfire Preparedness Day, a day to take action to increase wildfire safety in the community. 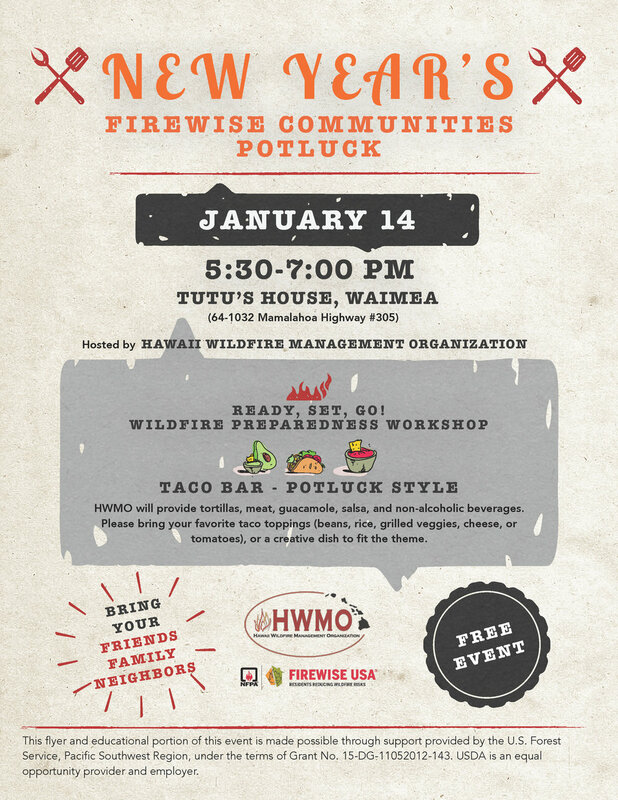 As part of the festivities the following week, Hawaiʻi Wildfire Management Organization (HWMO) and Nā Mamo O Kāwā (NMOK), two non-profit organizations, are teaming-up for a weekend of fun, learning, and action-taking. HWMO is a Waimea-based non-profit dedicated to protecting communities and natural resources across the Hawaiian Islands. Nā Mamo O Kāwā (NMOK) is a Hawaiian non-profit that facilitates the care for the precious cultural and natural resources of Kāwā through community-based, self-determined stewardship efforts. The next day, Saturday, May 11, you will have an opportunity to use your new wildfire preparedness knowledge to join a volunteer work day to reduce wildfire hazards and restore the native habitat of Kāwā. The work day will be from 9:30 a.m. to 1:30 p.m. If you would like to join, meet at the Northern entrance for Kāwā for sign-in, safety briefing, and opening protocol. Please bring a water bottle, lunch, closed toed shoes, long sleeved T-shirt, and pants. Tools, gloves, water, and light refreshments provided. Hosted by Councilmember Ron Menor’s Office. Hosted by Waianae Coast Disaster Readiness Team. Hosted by Honolulu County Department of Emergency Management. Hosted by Ewa Beach Emergency Preparedness Committee. Hosted by Be Ready Manoa. Join the broader community of Hawaii Island professionals dealing with wildfire threats and impacts for a facilitated conversation about next step hazard reduction priorities and projects. With every large fire, we lose more of our native forests and threaten the health of our nearshore areas. Nearshore water quality is greatly reduced due to pollution and runoff from post-fire erosion, impacting human health and smothering our precious coral reefs. Homes, businesses, livelihoods, and infrastructure are also threatened by wildfires. It does not have to be this way. Wildfires are a people problem -- 99% of wildfires are started by people. It is also a vegetation problem. By preventing ignitions and reducing flammable vegetation across landscapes, we can dramatically lessen the spread of destructive wildfires and thus protect the people and places we care about most. For the past several months, HWMO has met with dozens of agency and non-governmental landowners and land managers on Hawaii Island and across the state to map activities that reduce or manage vegetative fuels, such as roadside mowing, fuelbreaks, strategic grazing, clearing around structures or power poles, brush abatement or thinning, tree trimming, reforestation, agricultural production, etc. The purpose of the project is: 1) to develop maps and information that will enable the broader community of residents and professionals living and working in fire-prone areas in Hawaii collectively prioritize next steps for vegetative fuels management, and 2) to enhance project coordination between organizations and make use of funding opportunities toward optimal wildfire protection. Hawaii Wildfire Management Organization is a non-profit organization based in Waimea on Hawaii Island that serves as a hub for collaborative wildfire protection efforts statewide. With your participation at this FREE workshop on FEBRUARY 26, you will join a vibrant group of first responders, land managers, planners, community members, and more to prioritize future collaborative wildfire risk reduction projects on Hawaii Island. All are invited to this workshop -- we all play an important role in protecting our communities, lands, and waters from the growing threat of wildfires. Thank you to all of the landowners and managers who have contributed to this project thus far! Hawaii Wildfire Management Organization is a non-profit organization based in Waimea on Hawaii Island that serves as a hub for collaborative wildfire protection efforts statewide. With your participation at this FREE workshop on FEBRUARY 22, you will join a vibrant group of first responders, land managers, planners, community members, and more to prioritize future collaborative wildfire risk reduction projects on Hawaii Island. All are invited to this workshop -- we all play an important role in protecting our communities, lands, and waters from the growing threat of wildfires. Thank you to all of the landowners and managers who have contributed to this project thus far! Join the broader community of Kauai professionals dealing with wildfire threats and impacts for a facilitated conversation about next step hazard reduction priorities and projects. For the past several months, HWMO has met with dozens of agency and non-governmental landowners and land managers on Kauai and across the state to map activities that reduce or manage vegetative fuels, such as roadside mowing, fuelbreaks, strategic grazing, clearing around structures or power poles, brush abatement or thinning, tree trimming, reforestation, agricultural production, etc. The purpose of the project is: 1) to develop maps and information that will enable the broader community of residents and professionals living and working in fire-prone areas in Hawaii collectively prioritize next steps for vegetative fuels management, and 2) to enhance project coordination between organizations and make use of funding opportunities toward optimal wildfire protection. Hawaii Wildfire Management Organization is a non-profit organization based in Waimea on Hawaii Island that serves as a hub for collaborative wildfire protection efforts statewide. With your participation at this FREE workshop on February 21, you will join a vibrant group of first responders, land managers, planners, community members, and more to prioritize future collaborative wildfire risk reduction projects on Kauai. All are invited to this workshop -- we all play an important role in protecting our communities, lands, and waters from the growing threat of wildfires. Thank you to all of the landowners and managers who have contributed to this project thus far! Join the broader community of Oahu professionals dealing with wildfire threats and impacts for a facilitated conversation about next step hazard reduction priorities and projects. For the past several months, HWMO has met with dozens of agency and non-governmental landowners and land managers on Oahu and across the state to map activities that reduce or manage vegetative fuels, such as roadside mowing, fuelbreaks, strategic grazing, clearing around structures or power poles, brush abatement or thinning, tree trimming, reforestation, agricultural production, etc. The purpose of the project is: 1) to develop maps and information that will enable the broader community of residents and professionals living and working in fire-prone areas in Hawaii collectively prioritize next steps for vegetative fuels management, and 2) to enhance project coordination between organizations and make use of funding opportunities toward optimal wildfire protection. Hawaii Wildfire Management Organization is a non-profit organization based in Waimea on Hawaii Island that serves as a hub for collaborative wildfire protection efforts statewide. With your participation at this FREE workshop on FEBRUARY 19, you will join a vibrant group of first responders, land managers, planners, community members, and more to prioritize future collaborative wildfire risk reduction projects on Oahu. All are invited to this workshop -- we all play an important role in protecting our communities, lands, and waters from the growing threat of wildfires. Thank you to all of the landowners and managers who have contributed to this project thus far! 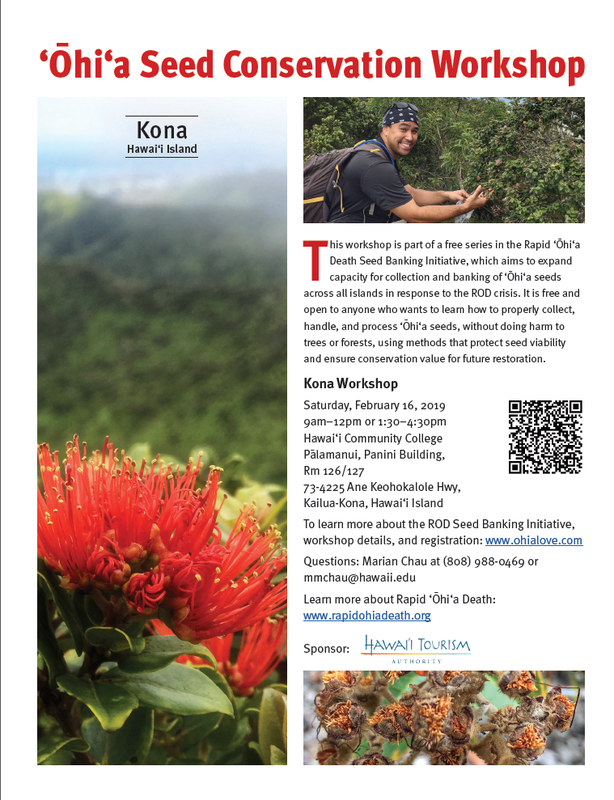 “By attending the FREE workshop hosted in Hilo and Kona, you will help to expand capacity for collection and banking of 'ōhi'a seeds in response to Rapid 'Ōhi'a Death. HWMO will be there! Come swing by our table for keiki activities and wildfire readiness information! Click above to enlarge or download the flyer as a PDF below. Wildfires are a growing health and safety concern all across the state and have many impacts to our communities, businesses, infrastructure, watersheds, and cultural and nearshore resources. In preparation for an unusually busy January through March for wildfires due to predicted El Niño-related drought conditions, Hawaii Wildfire Management Organization, is hosting this free and family-friendly educational “ReadySetGo!” Wildfire Preparedness Workshop. Learn how to use proper landscaping techniques and home structure modifications to protect your family and property from wildfire and to work as a community towards the common goal of fire protection. If you join the workshop and are from a nationally-recognized Firewise Community, your time at the workshop can be counted as volunteer hours towards your community’s wildfire risk reduction investment requirement. HWMO will also share information on how to develop a clear, achievable family emergency plan, what actions to take during a wildfire, and proper evacuation procedures. Each attendee will also receive a free copy of the ReadySetGo! Hawaii Wildland Fire Action Guide, which can be used as a step-by-step tool for carrying out the recommended actions. As an added bonus and opportunity to meet other proactive community members, HWMO will be hosting a make-your-own-taco potluck for attendees during the event. HWMO will provide tortillas, meat, guacamole, and salsa. Please bring your favorite taco toppings (beans, rice, grilled veggies, cheese, or tomatoes), non-alcoholic beverage, or a creative dish to fit the taco theme. Delicious food to go along with sharing ideas/updates/partnering opportunities for 2019 to better protect our communities from wildfire? Definitely worth joining us for! “We'll be outplanting and trail building if there is time!! The day will begin at 9:00 a.m. at the hiker check-in station and end at 12:00 p.m., with an optional potluck to follow. For those interested, there will be an opportunity to explore Kīpuka ʻowēʻowē, learn more about native plants, or just talk-story after lunch! 9:30 Head to Kīpuka ʻowēʻowē. 10:00 Hana!! Work together doing assigned tasks while enjoying each others company and taking mandatory water breaks! 12:00 Optional Potluck Lunch: Talk-story and get to know one another. You are welcome to stay for our family-style potluck, but you are free to leave at anytime! We’ll learn about Place at the hiker check-in station. We’ll then head to Kīpuka ʻowēʻowē where we will dive into either outplanting, trail building, or hand watering. After we pau hana, we’ll enjoy a nice potluck lunch. You then have the opportunity to explore Kīpuka ʻowēʻowē or just talk-story after lunch! Please email (napuuconservation@gmail.com) or call (808) 209-0596. Lunch to share for a potluck! More details coming soon including ticket purchase information! Stay tuned by checking back into our webpage or sign up for our e-newsletter (scroll down to the bottom of the page). Be Ready Manoa, a not for profit organization whose primary purpose is to educate and prepare our residents for disasters, is hosting the disaster preparedness fair open to the public. It’s FREE! Swing by to learn how to prepare for various types of disaster scenarios, including for wildfires. HWMO materials will be available at the event. Who will benefit: Residents (homeowners and renters) living in wildfire prone areas; and fire and life safety educators. Join the broader community of Maui professionals dealing with wildfire threats and impacts for a facilitated conversation about next step hazard reduction priorities and projects. As you may know, this summer has been a very busy and destructive period of our year-long wildfire season on Maui and across the Hawaiian Islands. This year alone, Hawaiʻi is on par with California in terms of the percentage of land area that has burned in 2018 (approximately 0.8% of the land area statewide according to Dr. Clay Trauernicht from University of Hawaiʻi CTAHR Cooperative Extension and Pacific Fire Exchange). The Lahaina fires during Hurricane Lane's approach in August 2018 caused extensive damage and loss to people's homes and impacted the livelihoods of many. With every large fire, we lose more of our native forests and threaten the health of our nearshore areas. Nearshore water quality is greatly reduced due to pollution and runoff from post-fire erosion, impacting human health and smothering our precious coral reefs. For the past several months, HWMO has met with dozens of agency and non-governmental landowners and land managers on Maui and across the state to map activities that reduce or manage vegetative fuels, such as roadside mowing, fuelbreaks, strategic grazing, clearing around structures or power poles, brush abatement or thinning, tree trimming, reforestation, agricultural production, etc. The purpose of the project is: 1) to develop maps and information that will enable the broader community of residents and professionals living and working in fire-prone areas in Hawaii collectively prioritize next steps for vegetative fuels management, and 2) to enhance project coordination between organizations and make use of funding opportunities toward optimal wildfire protection. Hawaii Wildfire Management Organization is a non-profit organization based in Waimea on Hawaii Island that serves as a hub for collaborative wildfire protection efforts statewide. 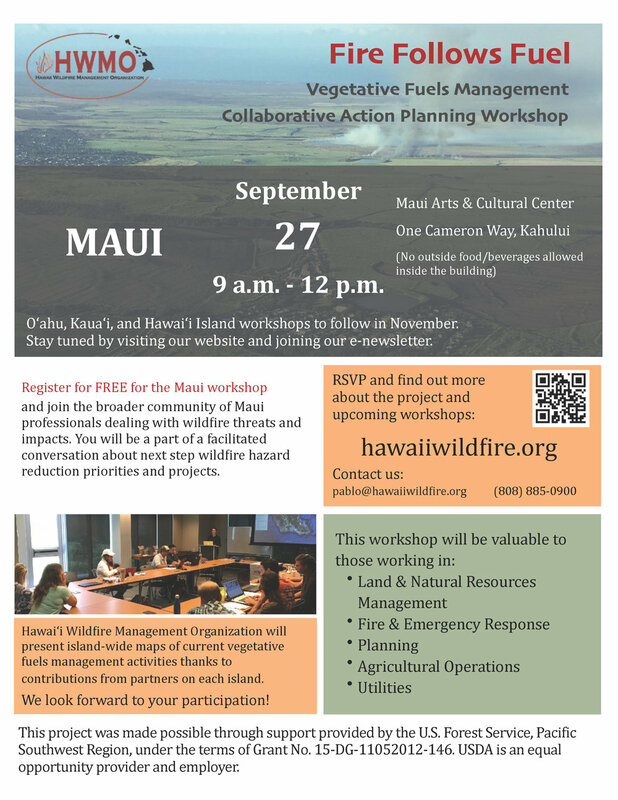 With your participation at this FREE workshop on September 27th, you will join a vibrant group of first responders, land managers, planners, community members, and more to prioritize future collaborative wildfire risk reduction projects on Maui. All are invited to this workshop -- we all play an important role in protecting our communities, lands, and waters from the growing threat of wildfires. Thank you to all of the landowners and managers who have contributed to this project thus far! • Outside food and beverage are not allowed inside the building. Water will be available.